The new Swarovski TLS APO 23 mm Aprochromat Telephoto Lens System adapter is the perfect solution for all digiscopers using system or Micro 4/3 cameras. The new TLS APO 23 mm adapter is a perfect fit for system and Micro 4/3 cameras. 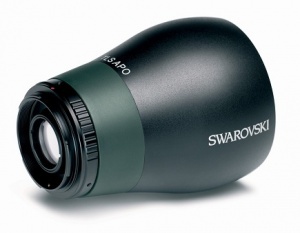 Along with the already established TLS APO 30 mm adapter, which is designed specifically for cameras with APS-C/DX sensors, it is a further addition to SWAROVSKI OPTIK’s portfolio of digiscoping adapters. Both adapters have the same design and are attached the same way, with the current T2 adapter rings fitting both TLS APO models. Digiscoping uses high focal lengths to cope with long distances. The digiscoping system, with its lightweight design and exceptional cost-effectiveness, makes it possible to switch rapidly between observing and shooting pictures. If the new TLS APO 23 mm adapter is used with a Micro 4/3 camera, compared with the TLS APO 30 mm combined with a Micro 4/3 camera, the smaller focal lengths allow lower aperture values to be achieved. The larger aperture allows shorter exposure times to be achieved and, therefore, maximum image sharpness. Another benefit of the smaller focal length is that the image section is larger, which also means a wider range of photographic options.